The MLB-E4202-10-G-F is a Managed Gigabit Ethernet switch, providing eight 10/100/1000BaseT copper ports and two 100/1000Base SFP ports. 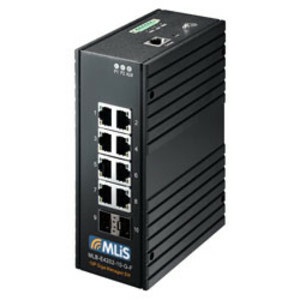 MLiS managed switches feature advanced networking features such as flash ring topology to provide redundant network paths and scale chain functionality to balance data flow control and achieve higher performance. Other features include: port-based and tag-based VLAN, IEEE 802.1ad/QinQ VLAN, VLAN tags, multicast, broadcast and flooding storm control, IEEE802.1x access control and VLAN mirroring. The multicasting supports IGMP v1/v2, Proxy and Snooping. Industrial features of the MLB-E4202 include a rugged fanless design, 1.5 kV port isolation, dual 12–58 VDC power inputs with reverse power protection and -40 to 75°C operating temperature. The MLB-E4202 it suitable for harsh industrial environments, telecommunications and 24/7 server farm applications. With the powerful features offered by MLiS Managed Switches administrators can easily prioritise, partition and organise industrial and commercial networks. The D-Link ANZ DWM-312 4G LTE M2M dual SIM router has advanced VPN capabilities. 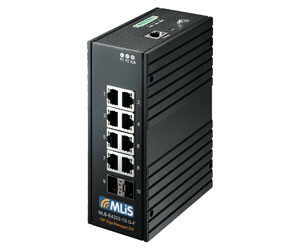 I am interested in MLiS Industrial Ethernet Switch with Gigabit Copper and Fibre Ports .